POE Analog Clocks, automatically synch to the NTSP system. Plug and play. Five large 13" POE Analog clocks and setup software. Save on additional clocks. The TimeTraxSynch Wireless Clocks-In-A-Box bundle from Pyramid synchronizes all your clocks to your network, and can synchronize your network to the NTSP servers. Synchronize your wall clocks with networked computers, all at once. Add as many additional Analog or even Digital clocks as you like, on the same network. * Must be the same company or organization, as this is licensed software. 3 Year USA Technical Support, Made In U.S.A. 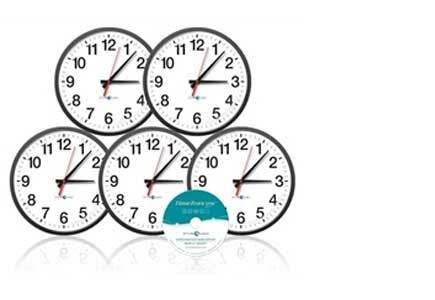 Call for custom pricing on additional clocks.